The Lone Star Knife Expo June 13th and 14th at the Dallas Market Hall! 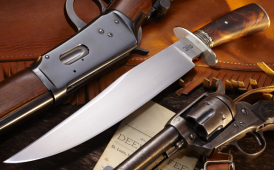 THE STATE OF TEXAS AT DALLAS MARKET HALL ON JUNE 13 & 14 AT THE LONE STAR KNIFE EXPO. Come out and see all of the fun. This will be the largest collection of custom knifemakers in the State of Texas this year. Come and check out all the beautiful custom knives. The Lone Star Knife Expo will be located in the North Hall with the Military Show. Bladesports International Cutting Competition will begin their season with a cutting competition on Sunday and exhibitions performed both days. Brandt Noel will put on a sword cutting exhibition. You can register for a drawing for a highly coveted Jerry Moen custom caping knife. The Dallas Arms Collector’s Association will their have wonderful gun show in the main exhibit hall. So much, it will take 2 days to see it all. Come out for all of the fun. Donovan Phillips Set New World Record for Water Bottles Cut for Bladesports in Texas!! Donovan Phillips set the World Record for water bottles cut on March 28, 2015 at Warren Osborne’s house for Bladesports International. Way to go Donovan. Bladesports Returns to the Lone Star Knife Expo in Dallas on 6/13/2015! The Lone Star Knife Expo and Dallas Arms Collectors Association are proud to announce the return of the Bladesports Cutting Competition Trail to the show! Below is a video of Dan Keffeler’s Winning Cut in 2013. The competition will occur on Saturday, June 13th 2015 at Dallas Market Hall. Come see you favorite cutter compete for the $1,000.00 prize. Exhibitions and instructions will be presented as well. Come see all the fun. For more information visit our page or site, as well as Bladesports’ site. 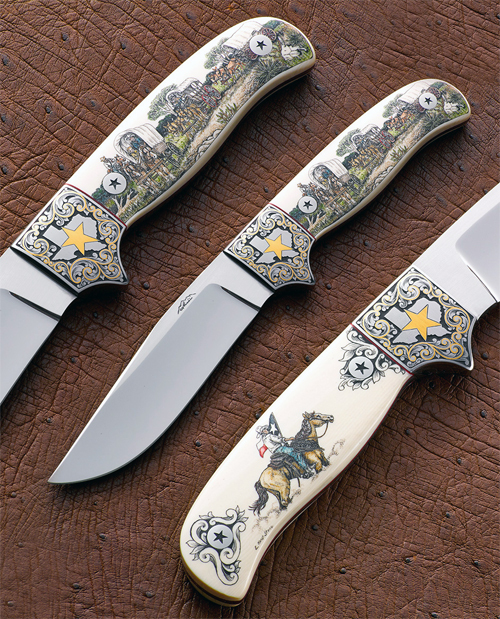 The Lone Star Knife Show is the largest collection of custom knifemakers in the southwest and will occur June 13th & 14th, 2015 at the Dallas Market Hall in Texas. For more information, contact Vance Hinds, vancehinds@gmail.com, 101 Sports Row, Waxahachie, Texas 75165, 972-937-3000. Don’t forget the Guadalupe Forge School of Knifemaking & Bladesmithing 2015 Winter Hammer-In & Knifemakers Rendezvous will occur on Febuary 7th and 8th in New Braunfels, Texas at the knife shop of Johnny Stout. Class size is limited to the first 30 students. Tuition is $200. An awesome opportunity to learn. I do not know if there are any spots left open, but if so, don’t miss this wonderful opportunity. Contact Johnny Stout at 830-606-4067. Great Knife Making Video from the Mastersmith Ray Kirk of Raker Knives! Ray Kirk of Raker Knives posted this video on his facebook page and graciously allowed others to share it. Thank you Ray Kirk for sharing your knowledge on knifemaking. It is an awesome video. It answered several queations I have had over the years and couldn’t figure out. Kudos to Ray Kirk!. Please visit his facebook page and website below. This is a master craftsman making a beautiful knife. The First Board of Directors Meeting of the Texas Knifemakers Guild will occur January 17, 2015 at the Dynasty Chinese Restaurant in Temple, Texas. January 17, 2015 at 12:00 p.m.
We have the back room reserved from 12-4. The reservation is under Vance Hinds. Let me know if a lot of people anticipate coming to observe the meeting. I wiill post the agenda before the meeting. If you want something on the agenda, send it to me in writing by January 10th. We will follow the agenda at the meeting. Anyone can speak on an item buy only the directors will be voting. OFFICIAL VOTE ON THE REGIONAL MAP! Below are 3 options for our regions map. 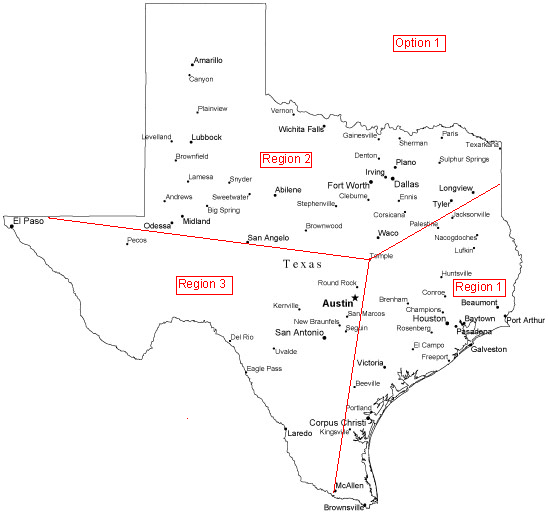 Please vote on the option that you want for our regions map in the Texas Knifemakers Guild Group on facebook. VOTING CLOSES SUNDAY NIGHT AT 8:00 P.M., 11/9/14! Whichever region has the most votes at 8:00 p.m. tomorrow night wins. Region 2 is having a discussion Sunday night at 9:30 p.m., so we need something set by then so that Region 2 people can participate. Please remember that these regions nomimate the 5 board members from that region. The Board of Directors at the first meeting can change the regions. But the vote will determine the regions for selection to the initial Board of Directors. Also if near boundary line or out of state, you can select the region you are in. Only vote once. Vote by posting “Option ___” in the space below. Hopefully this will put the issue to rest until the Board of Directors meeting in January. Option 1 is my stab at the state. Option 2 follows the natural contours of the state and the design on the flag. Option 3 is a modified option 2 with Abilene staying with San Angelo.